Best value in internet marketing! Premium ad will run for 6 months! looking for horses just like yours! - let us market your horse to thousands of prospective buyers. Perfect way to get started. Tell our visitors about your horse. Describe your horse for sale- tell your story for FREE! or horses for sale. Packages run one full year. ads often as you desire. The one stop resource for horse owners! FREE Listings! What about Mare & Foal or Driving Teams? If you are selling several horses together as a unit, like a driving team or a mare and her foal, it's okay to put them in a single ad. How do your contracts work? No Contracts. Simply purchase your ad type. Annual Farm packages, single ads, or choose an unlimited month-to-month ad plan that you may cancel at any time. It’s easy to stop your service at any time. Why type of ads do you have? We offer ads for horses, stallions at stud, tack, equine products & services and real estate. We have several different ad types including unlimited ad packages. Choose the ad that best fits your budget. How many horses can I have in one ad? 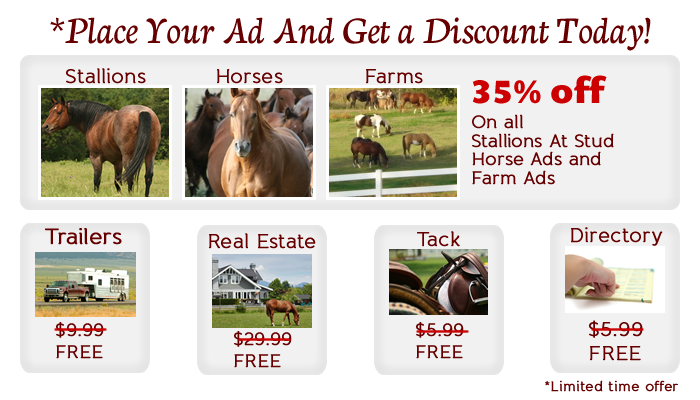 Only One horse/item/trailer per ad: Each ad is designed for only one horse/item/trailer to maximize your exposure. It may not be used for several horses at once, and if the first horse sells or you decide not to sell it, the ad may not be "re-used" for another horse. (does not apply to farm or dealer package customers). I have moved- how do I change my contact information? Log into your dashboard, and select the “My Account” tab. This will allow you to update your address, phone, email, and website information. How do I renew ads that have expired? Log into your dashboard and click the Renewal box. You will see your ads that are up for renewal. Click the “Renew Ad” button next to the ad you would like to renew. I have forgotten my username and password. How do I retrieve them? On the Sign In page below where you would enter your password, you will see an area that says; Forgot username or password? And Need help signing in? Click the link to have your password automatically reset for you. On a Farm account package how do I activate my ads? When you have finished building your ad. Click on the Farm Package button in your dashboard. You will need to click on “Activate” to set the ad live on the site. You can preview your ad and make changes before sending the ad live from your dashboard. How do I mark a horse sold? Access your dashboard through the login feature; click my farms (if you have a farm account) or my horses. Scroll to the horse and click the “Mark as Sold” button. You may also delete the horse if you wish. Horses will automatically be deleted at the end of the ad time period. How can I add a link to MyHorseForSale.com? Log in / create an account, click on the Directory button and add your link. We except family friendly equine links and events. How do I get more information about your affiliate program? To learn more about our affiliate program, please call or email us at 405- 485-4224 or email at sales@myhorseforsale.com. Is there a charge to change my pictures or video? No; we never charge to change your photos or video’s. We understand that horses change with the seasons and with training, update as often as necessary to provide the best pictures of your horse. How do I upload my photos? Do I have to use a special format? To upload photos log into your account, click the Dashboard page and select the category your ad is in (Farms, Stallions, Horse, Tack, Trailer, Real Estate, Directory) Click the Add Photo/Video button next to the name of your ad. You may upload your photos in the following formats JPG, PNG, GIF or TIF formats. What Type of Video can I upload? MyHorseForSale.com allows you to add unlimited Youtube and Vimeo video links to our premium and package ads. How do I change the default picture? The default picture will automatically be the first picture you load into the system. If you wish to change the default picture, simply click “Make Default” to the right of the pictures in the preview section of the ad. I changed my pictures, but I still see the old one, why? Occasionally you will load new pictures to your ad, when you preview the ad you will see the old pictures. Try refreshing your page, if this does not pull up the new pictures, simply close your Internet browser and restart the computer. I want to have an Online Auction, what types of Online Auctions do you have? MyHorseForSale.com offers custom Online Auctions for Stallion Service Auctions, Production Sales, and Charity Auctions. For pricing and more information call us at 405-485-4224 or email us at sales@myhorseforsale.com. List 10 or 1000 properties! Realtor packages are an inexpensive and highly effective way of promoting your equine properties. MyHorseForSale.com is the premier place to list your equine property for sale. You can provide very detailed information about your property along with unlimited photos and video. We offer Realtor Packages with unlimited ads. List all your properties including horse farms and ranches on your very own Realtor page. MHFS Realtor packages are an inexpensive and highly effective way of promoting your equine properties. Increase your exposure, advertise with us! Start a new Realtor package for as low as $49.99 per month. Just have one farm to sell? Its fast and easy to list your property. Just click here to start, ads are only $29.99. Unlimited General Store Ad Packages are great for new & used tack dealers or equine related businesses. Advertise as many of your tack and equine products you want for one low monthly fee. Customize the “Store page” with name, logo, bio and contact info. MyHorseForSale.com is the premier place to sell your tack and equine related products. You can provide very detailed information about your products or service along with unlimited photos and video. We offer unlimited ad packages. Sell one item or list unlimited tack, boots, blankets, equine products, show clothes, etc in your very own General Store package. MHFS General Store packages are an inexpensive and highly effective way of promoting your equine related products. Increase your exposure & improve your profits. Advertise with us! Start a new store for as low as $39.99 per month. Just have one item to sell? Only $5.99 per ad. Its fast and easy to sell your tack and equine related products. Just click here and choose your category. A Free 'Basic Listing' includes your company/organization's name, address, and phone number. Choose up to 5 categories FREE. Your company/organization's name is bolded, and includes address, phone number, a link to your website, and 20 word description. Extra categories can be added for $5.00/year each. The one stop resource for horse owners! The MyHorseForSale.com Directory is a resource for horse owners, enthusiasts and equine businesses. Browse our directory to find equine products and services available in the US & Canada. If you sell equine products, services, manage an association or pony club - this is the place to list your business and website. Advertising in the MyHorseForSale.com Directory is an inexpensive and highly effective means of driving more customers to your website. Increase your exposure & improve your profits. Advertise with us! Trailer Dealer Package $49.99 per month. List 10 or 1000 Trailers! Dealer packages are an inexpensive and highly effective way of promoting your Trailer Dealership. MyHorseForSale.com is the premier place to sell your horse trailer. You can provide very detailed information about your trailer along with unlimited photos and video. We offer dealer packages with unlimited ads. Sell one item or list unlimited trailers for sale in your very own Dealer package. MHFS Dealer packages are an inexpensive and highly effective way of promoting your horse trailer dealership. Increase your exposure & improve your profits. Advertise with us! Start a new dealership package for as low as $49.99 per month. Just have one horse trailer to sell? It’s fast and easy to sell your trailer. Just click here to start, just $9.99 per ad.